Denkmal is one of the largest European forums on the preservation of architectural heritage. About 5,000 people visit the event every year. This year, exhibition participants included representatives from state heritage preservation organizations and leading restoration organizations from Germany, Italy, the Netherlands, Russia, France and other countries; science and research organizations; customers and investors of repair and restoration work, as well as students from the capital’s colleges who study restoration. Mayor of Moscow Sergey Sobyanin gave the opening speech at the event. “I’m happy to welcome you at the exhibition from our colleagues in Germany, Italy, France, Austria, and other countries. ‘Denkmal, Russia – Moscow’ has truly become a tradition. We use this platform to discuss problems and the historical development of our cities. I thank everybody who takes part in this movement, who is participating in today’s exhibition. Welcome to Moscow!”. 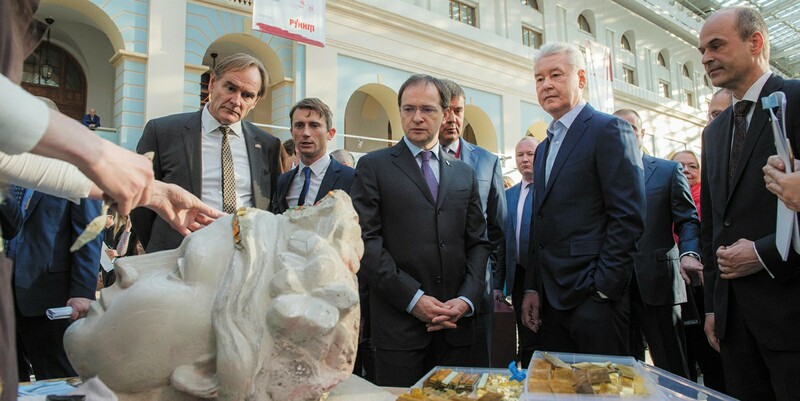 According to Sergey Sobyanin, the main goal of the fair is to find harmony between city development and the preservation of cultural heritage. The combination of history and modernity in the capital can be observed in the metro, which features architecture from the past century and new technology, on the streets, where old buildings stand alongside skyscrapers, and in the center of the city, where restoration work for the Patriarchal Metochion was carried out at the same time as the construction of the modern Zaryadye Park. “We see historical streets that open up, ridding themselves of cobwebs made out of wires, lurid signs, and closed shop windows to reveal their beauty and history to Muscovites,” he said. Over the past few years, almost one thousand architectural monuments have been restored in the capital and 8,000 buildings have been renovated, complete with architectural lighting. “These are revolutionary transformation that have made Moscow more comfortable and beautiful. I want to thank the restoration community, whose activities have essentially been reborn, who put their soul, skills, and heart into the restoration of unique Moscow monuments, and to thank the private companies who invest their funds into restoration projects,” the mayor of the Russian capital said.